In my last post (What is Instructional Design? part 1), I explained my idea of what instructional design is. In this post, I want to explain a little further the kinds of tools an instructional designer uses to create worthwhile learning experiences. Instructional designers use 3 main types of tools in their work: (1) instructional theory, (2) instructional design processes, and (3) instructional technologies and tools. This video explains how these are used. (You can also continue reading below for more details). 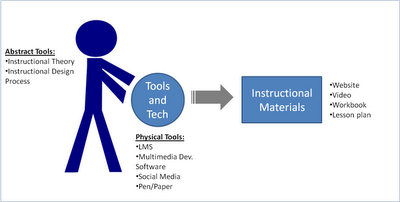 The picture below demonstrates the activity of an instructional designer as it relates to these tools. First, I want to clarify that the tools designers use are either abstract or physical. Abstract tools are those that instructional designers use to guide their thinking and actions. I categorize them as instructional theory and instructional design processes. Physical tools are those that are used to actually develop instructional materials, which I categorize as instructional technologies and tools. So, in our picture, the instructional designer uses physical tools and technologies to manipulate content and create materials that the learners will interact and learn with. These physical tools can be a computer, software, a camera, a Learning Management System (LMS), etc. These tools are used to develop physical materials. A good instructional designer also works with abstract tools as they design instructional materials. He or she considers what is known about good instruction, which should include awareness of current instructional theory. For example, Merrill's First Principles of Instruction is a set of research-based prescriptions for how to create effective instruction. Instructional Designers also think about specific instructional design processes as they develop the material. For example, the ADDIE process walks students through the basic steps of instructional design to help ensure that quality instruction is created. The abstract tools are used to guide the development of the physical materials and help ensure the materials adhere to abstract concepts of what works in instruction. The important thing here is that instructional design is an activity that involves the use of tools to create instructional materials. If you have any additional thoughts on the activity of an instructional designer, I would love to read them. This view is based on my experience and thinking, and I am sure that others have additional insights to share. Thank you for this very informative and helpful video of what an instructional designer does. I am starting my first ID position this week. I appreciate hearing how you used the instructional design theories and instructional design process to develop an actual course. I have wondered how to use the instructional theories I recently learned about through my coursework to earn an instructional design certificate. I found it helpful to know you used more than one theory (Merrill’s First Principles of Instruction and the Pebble in the Pond theory - which I have to learn more about) to organize and create content for the course you designed. I will be working with SME’s (faculty) who have experience teaching in a physical setting, but will now be learning how to take what they teach in the classroom to the online classroom. I think this could be quite a challenging role! Your video helped me to clearly see my role and how complex ID can be. The organization I will be working for uses a design framework model that: (1) identifies the performance objective; (2) identified the learning elements; (3) determines the learning path/trajectory; (4) identifies the assessments to use; and (5) prepares the educational plan. I believe it is important to know the performance objective or lesson objective at the start of building instructional design. I wondered if you include assessment methods in the courses you build. Thank you for such an informative blog. I will be referring to your site often! Thank you, Amy, for your comment, I really appreciate it. Good luck with your new position - my first official instructional design position was in higher education, as well. Let me know if I can help with anything as you move forward.